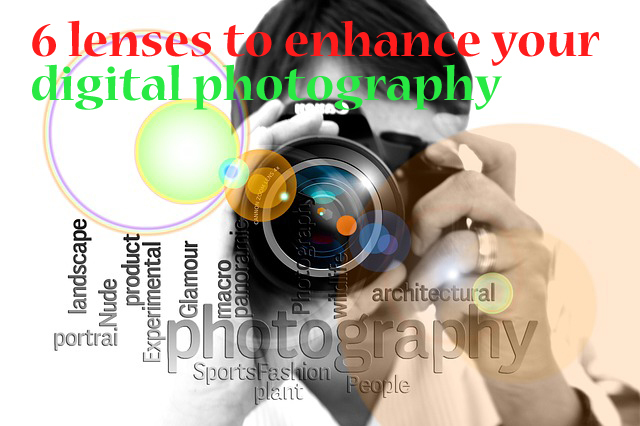 Anybody who has used a DSLR would be able to appreciate the attention to the minutest details that it brings. For the generation that is content with clicking from a smartphone camera, the beauty of photography remains oblivious. However, to an avid photographer there is no word in their dictionary called as perfection. He or she always strives to get the extra bit from every shot. Sometime, even the premium digital camera that they possess can fall short of their expectation. 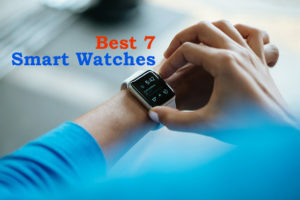 In the field of optics there are a few factors that one has to consider to obtain a near perfect image through an image capture device. These include chromatic aberration (an effect due to the failure of a lens to focus all colors to the same convergent point), distortion (deviation from a rectilinear projection, usually in zoom lenses – pin-cushion, barrel etc. ), coma (imperfection due to off-axis point sources, usually in the case of long distance objects), astigmatism (blur due to difference in focus), tilt and so on. Here, we deal with lenses that can get you that near perfect shot that you’ve been longing for. This one is for those digital photographers, who unendingly crave for perfect shot. 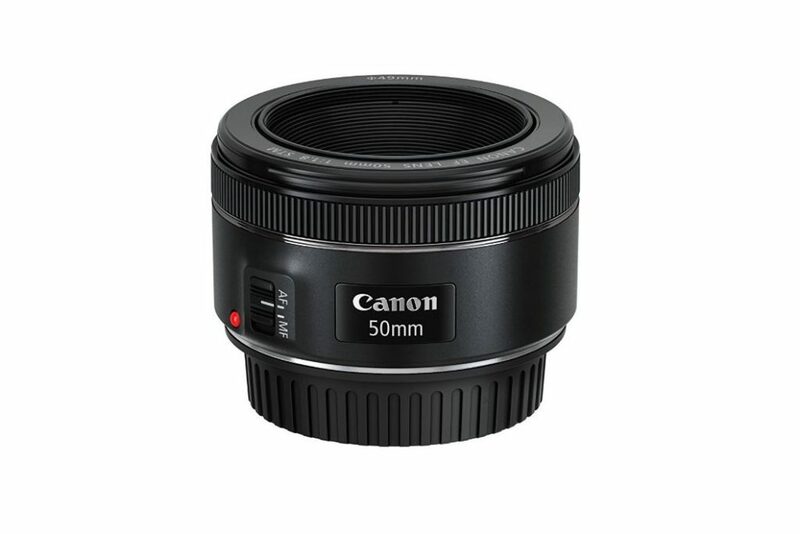 The Canon EF 50 mm f/1.8 STM lens is great to take portraits and action photography. It also excels in night time photography. As the name indicates, it has a 50 mm focal length and a maximum aperture of f/1.8. This lens has a minimum focusing distance of 35 cm, while the maximum possible magnification is 0.21X and the minimum aperture is f/22. 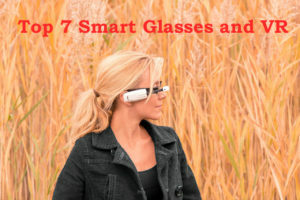 This lens features Cannon’s Stepper Motor Technology, a quieter and smoother focus system that enables near silent focus while recoding videos. The filter size is 49 mm, while the diagonal angle of view is 46 degrees. You have an auto focus to go with the full time manual control. The Movie Servo AF feature helps you take moving pictures with ease without losing the focus on the object. 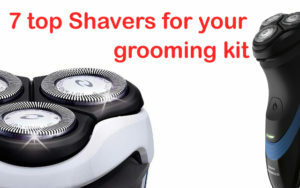 The device weighs only 160 grams. In the box you get the Canon EF 50mm f/1.8 STM Lens, one E-49 49mm Lens Cap, one Lens Dust Cap E (Rear) and the Warranty card. The maximum aperture of this lens can get as low as f/1.8. Lower the value of maximum aperture, faster is the lens’s ability to let light pass through. This aids in taking low light photography even without the need of a flash. The metal mount gives the lenses a premium feel and we have no difficulty in setting this up as the matte grip gave it a non-slippery feel. The image captured of long distant objects like stars can suffer a bit of barrel distortion. Otherwise, we found this lens to be more than acceptable. The macros can be shot as close as 35 cm. If you are planning to get a set of lenses for the first time, go for this. 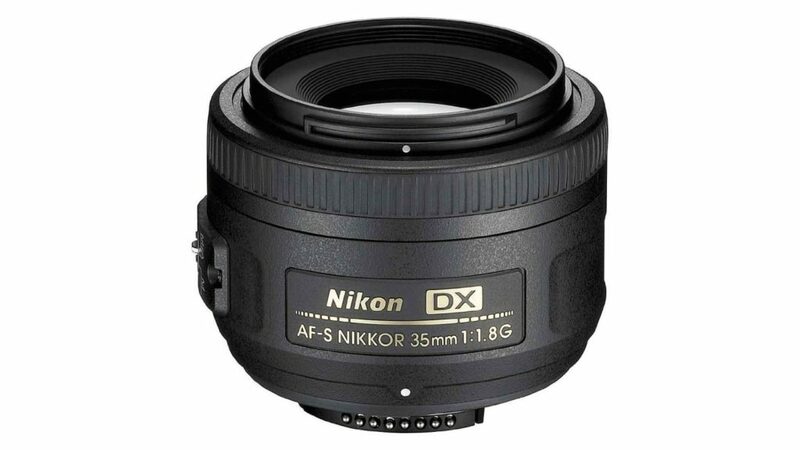 The Nikon AF-S DX NIKKOR 35mm f/1.8G Lens with Auto Focus is specifically for Nikon DSLR Cameras. It has a focal length of 35 mm, which would increase to 52.5 mm when used in conjunction with a DX camera. The maximum aperture is f/1.8 and the minimum is f/22. This lens is also equipped with an Ultrasonic type auto focus motor, while also possessing a manual focusing control and 52 mm filters. The minimum focus is 1 feet (0.3 meters). The unit weighs 210 grams and includes the fixed zoom lens, HB-46 Bayonet lens hood, LC-52 Snap-on Front lens cap, LF-4 Rear lens cap, and a CL-0913 Soft case. This a relatively compact and light weight lens and hence easy to carry around. 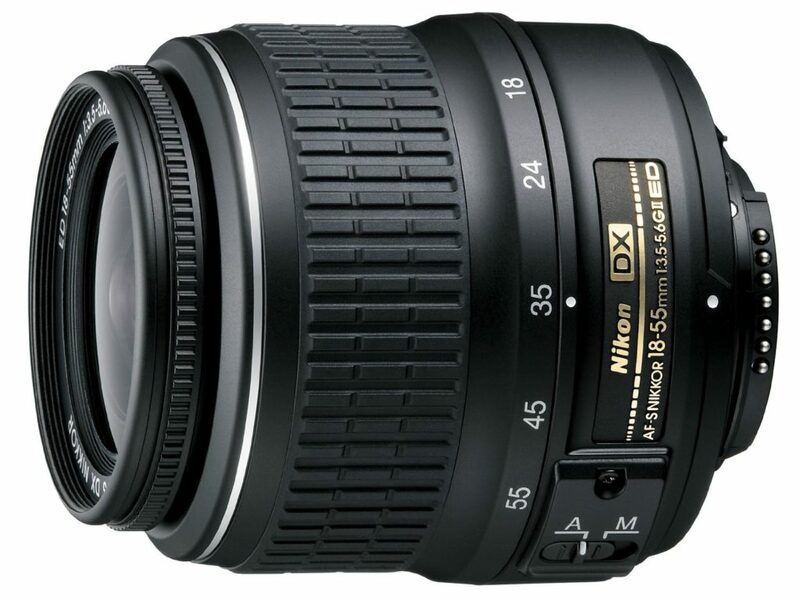 The AF-S DX NIKKOR 35mm f/1.8G provides high image reproduction capability and picture quality. A macro can be shot from a distance of 30 cm. The lateral chromatic aberrations in the form of purple or cyan fringes along contrasting edges are noticed when you use these lenses with old cameras. With an aperture set at 1.8 the output image was incredibly sharp with great color and contrast. If you are a Nikon DSLR buff, this one is for you. 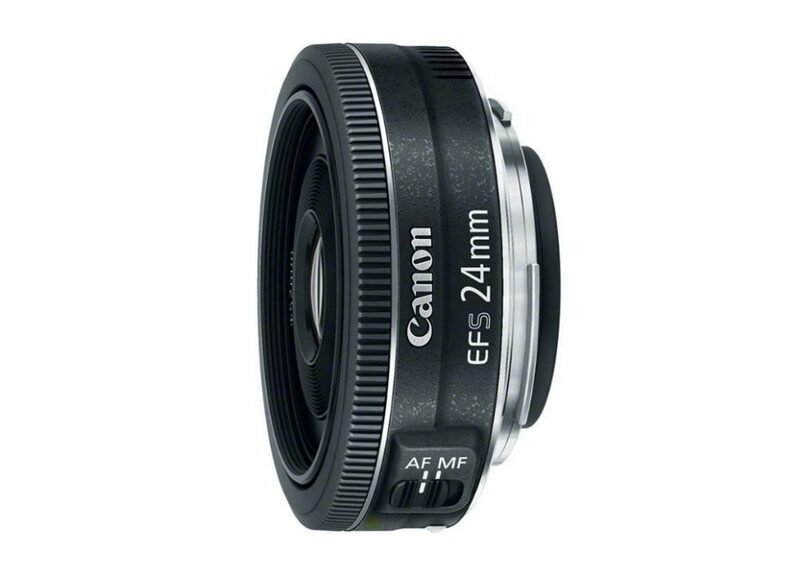 The Canon EF-S 24mm f/2.8 STM Lens is a wide angled lens for Cannon APS-C (Advanced Photo System type- C) Cameras. The measure is equivalent to 38 mm focal length on a full-frame camera. 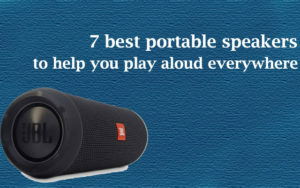 It has a micro-stepping driver control for smooth and quiet continuous AF while capturing video and in live view mode. It also includes an aspheric lens element, optimized lens arrangement and coating to minimize ghosting and flare, a circular seven-blade circular aperture, full-time manual focus override, and a short minimum focusing distance of only 16cm. As the name indicates it has a focal length of 24 mm with a maximum aperture size of f/2.8. The diagonal angle of view is about 59 degrees and 10 minutes and it has a filter size of 52 mm. In the box you get 1 EF-S 24mm F2.8 STM, Len Cap E-52II, Lens Dust Cap E, and One Year Limited Warranty Card. Weighing just 125 grams and just 23 cm long, this is the lightest and slimmest Canon EF-S lens ever produced. However, this can be used only on a Canon EOS APS-C body. The Canon EF-S 24mm f/2.8 STM feels quite solid to hold, in spite of the all-plastic body, with the metal mount. The focusing ring is narrow, but has a rubberized grip that assists with the finger-tip operation. We found the autofocus to work pretty fast with this arrangement. The Chromatic aberrations are well controlled and macros can be shot from pretty close range. If you are looking for a tiny and light prime lens that delivers surprisingly good quality images, this one is for you. 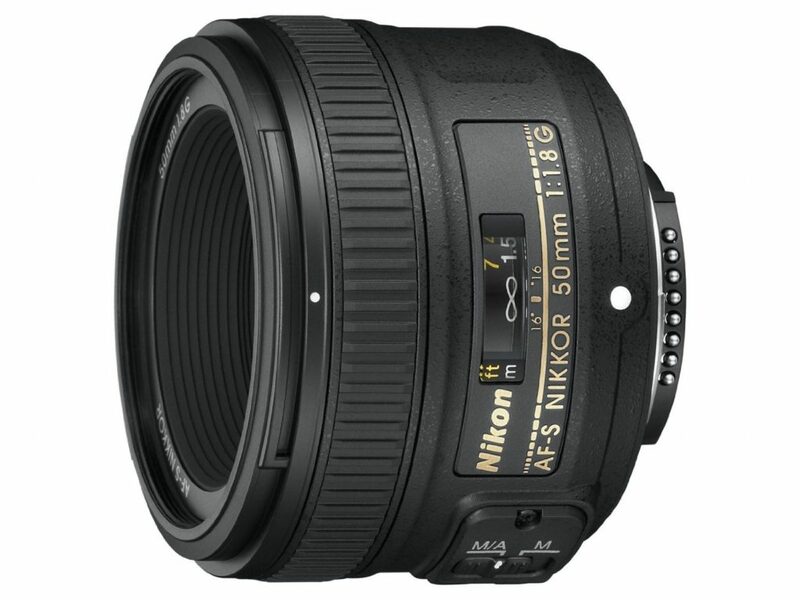 The Nikon AF-S FX NIKKOR 50mm f/1.8G Lens with Auto Focus features a fast and upgraded FX-format prime lens. The maximum focal length is 50 mm while the maximum aperture size is f/1.8. 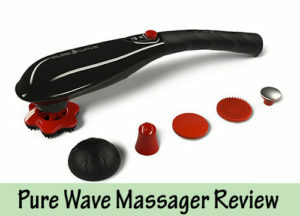 It features a built-in silent wave motor and an aspherical element. The filter is 58 mm and offers a 47 degree diagonal angle of view. You get the following in the box – One AF-S FX NIKKOR 50mm f/1.8G Fixed Zoom Lens for Nikon DSLR Cameras, one HB-47 Bayonet Lens Hood, one LC-58 Snap-on Front Lens Cap, one LF-4 Rear Lens Cap, and a CL-1013 Soft Case. It weighs 185 grams and is a bit heavy on paper, but is still a lightweight one to balance well on a Nikon DSLR camera. The AF-S Nikkor 50mm f/1.8 lacks a Vibration Reduction or a focus limiter, the only control on the lens barrel is a focus mode switch with the usual M/A and M settings. 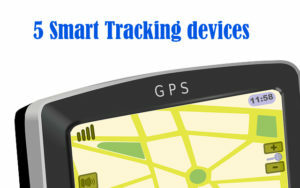 The mount is made of metal and is sealed to prevent dust and moisture. Centre sharpness is impressive wide open, and the borders are also sharper. Chromatic aberrations were hard to find in this. With a closest focusing distance being on the higher side (45 cm) this is not ideal for macros. The new optical design delivers much better performance and also allows full-time manual focus override. Even DX users can use this AF-S 50mm f1.8G, as it can be used as an excellent short telephoto portrait lens on their cameras, including on entry-level bodies that lack a body-integral focus motor. Having said that all major aspects of this lens are great and I would give a 5/5 for image quality. 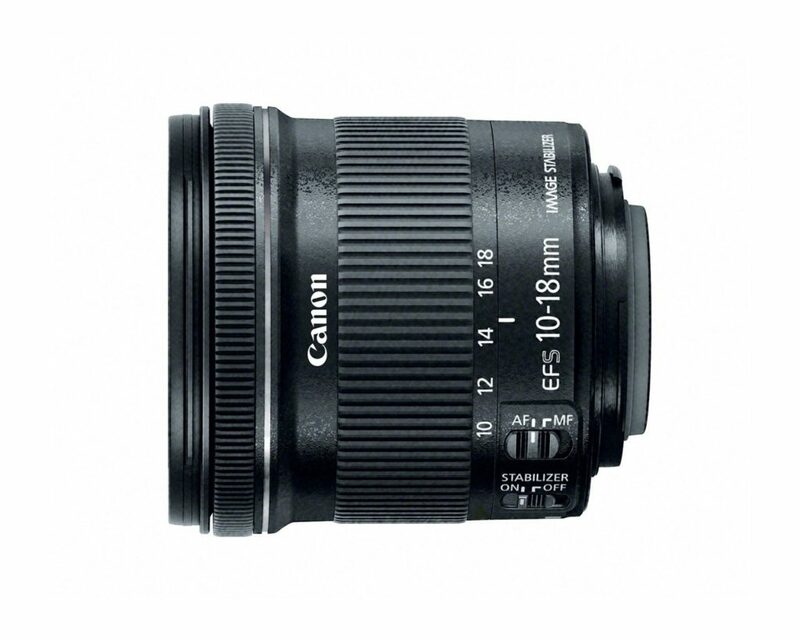 The Canon EF-S 10-18mm f/4.5-5.6 IS STM Lens is an ultra-wide zoom lens for Canon’s APS-C DSLR Cameras. Necessarily, the aperture size is on the shorter side. It gives a focal length equivalent to 16-28.8mm and features a stepping motor for smooth and quiet continuous AF while capturing video and in live-view mode. 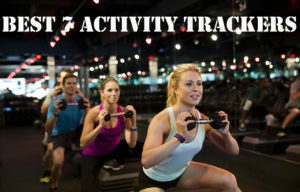 It also has a four-stop optical image stabilization feature. The minimum focusing distance is only 22cm and the image filter is a huge 67 mm. 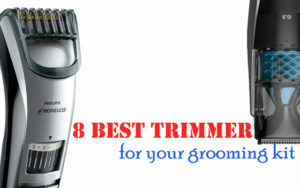 It features a super Spectra coating that minimize ghosting and flare, and a non-rotating front element. The box consists of EF-S 10-18mm f/4.5-5.6 IS STM Lens, a Lens Cap E-67II, Lens Dust Cap E and an Instruction Manual. Weighing just 240 grams and measuring just 72 cm long, this Lens is one of the most compact and light-weight wide-angled Zoom lenses offered from Canon. It can be used only on a camera that has a body like the Canon EOS APC-C body. It has an all plastic construction, probably to keep the weight low. But still it has a very good grip. The optical image stabilization is a huge plus and it also offers full-time manual focusing even when the AF is selected. The focal range of this lens is something you would love. At 10mm focal length the angle of view is 107 degrees and 30 minutes while at 18mm focal length the angle of view is 74 degrees and 20 minutes. The auto focus works pretty fast in ‘good’ and ‘bad’ light conditions. There is a bit of barrel distortion at 10 mm focal length with f/4.5 aperture but that disappears by 18 mm. The closest you can get is 22 cm to shoot a macro. The center sharpness is excellent at all zoom levels at the maximum aperture. 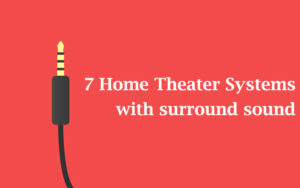 The STM motor ensures that video shot smooth and quiet. This is a recommended buy for APS-C DSLR owners for pleasing image and video shoots. The Nikon AF-S DX NIKKOR 18-55mm f/3.5-5.6G ED II Zoom Lens with Auto Focus for Nikon DSLR Cameras comes from the family of normal zoom lens. The focal length ranges from 18 mm to 55 mm while the aperture size has a minimum of f/38 and a maximum of f/3.5. It has the ED glass element to reduce chromatic aberrations and give an exceptional image output. The aspherical lens elements reduce astigmatism and other distortions to deliver high resolution and contrast. The box consists of AF-S DX NIKKOR 18-55mm f/3.5-5.6G ED II Zoom Lens for Nikon DSLR Cameras, LC-52 Snap-on Front Lens Cap, and a LF-4 Rear Lens Cap. The picture angle this lens offers at 50 feet distance ranges from 28 to 76 degrees. The macro focus range is about 28 cm while the filter attachment size is 52 mm. Both the barrel and the mount is made of plastic to keep the weight low. However, it doesn’t appear to be flimsy. The unit weighs about 204 grams. The lens gives you a 3x 18-55mm focal length range, which easily covers picture angles that meet the needs of everything from tight portraits to wide-angle landscape clicks. This lens is ideal for outdoor photography. This lens is designed exclusively for the Nikon DX format digital SLR cameras and is not compatible with 35mm  or IX240 format film cameras. I feel safe to say that this is one of the best lenses for individuals who are just starting out with DSLR photography. Get your hands on any one of these wonderful lenses and start your trip to the journey called Photography. 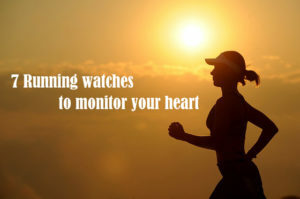 I am sure you would appreciate the difference it brings to your photography. You will realize that you can hone your photography skills and become an expert photographer – always in the search for that perfect shot!